How worried should Australians be about immigrant criminals? Man Haron Monis was not just a violent convicted criminal when he besieged Sydney's Lindt cafe, he was also a self-styled Islamist and a migrant. As part of a visible minority - and thus under constant pressure to be an ambassador for migration - I am bracing myself to hear the most self-righteous anti-immigration opinions since 9-11, e.g. "We shouldn't let 'them' into the country." Being a victim apparently justifies ignorant overreaction. What do I mean by ignorance? 81% of Australia's prisoner population is Australian born. Although this reflects in part the greater proportion of Australia's population born locally (72.3%), the Australian born imprisonment rate - prisoners per 100,000 population - is comparatively high compared with those from other countries. You are more likely to be the victim of someone who looks like this. Violence is not the exclusive domain of the immigrant, with 22.81% of Australian born prisoners having 'acts intended to cause injury' as their most serious offence. Natural Australians also top 'Dangerous or negligent acts endangering persons' (2.92%), or what I call 'acting like a bloody idiot'. Furthermore, crimes we attribute to 'clash of civilisations' stereotypes are not reflected in the numbers. 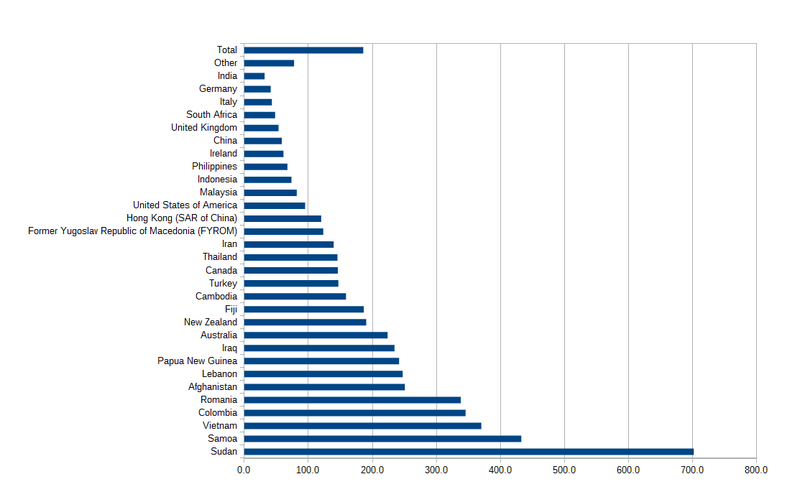 Prisoners from the UK, Fiji, and the Philippines - all Christian countries - are most likely to have sexual assault as their most serious offence. Perhaps cultures with burqas are not what we should target when we say 'no' to violence against women. Die-hard racists will assert that second-generation migrants are more prone to crime, and that this pushes up the Australian-born prisoner numbers. While there is no Australian data, this has been debunked in the U.S. That said, if we want to spread panic about certain ethnic groups specialising in certain crimes, there's plenty of lower-hanging fruit than linking terrorism with immigrants from the middle-east. I put it to you that the disproportionate media response to the Sydney Siege is not because Australia takes issue with racially motivated violence, or even violence per se. Witness how quickly Australia gets over Cronulla riots, Indian student/taxi-driver bashings, and schoolies sexual assaults. I believe that proudly secularist Australia is especially disturbed by criminality with a religious flavour. But that analysis is the forte of another learned friend.